The cutest Peter Rabbit you ever saw! The pattern is Primrose Lane Michaela. I had heard that it ran a bit short in the length so I lengthened it 3/4" and made the sleeves about 1/4" wider. The fabric is Fabric Finders Dobbie. I like the look and texture of the fabric but I will tell you it is a boogerboo to iron. I should clarify, not to iron, but to keep looking ironed. It has a very crisp hand after it is washed, almost like a shirting. Actually is sounds like shirting as you are handling it. Jan of BessieMary and I were discussing differences in fabrics after they are washed when I was looking for fabric for the christening gown. This fabric was softer before washed. I am okay with it, but will admit not too sure how happy baby's mother is going to be with me. Oh well. The collar is again one more scrap from that "hunk" of pique I used for Wally. I wonder how many more things I can squeeze out of it. I have to figure out what it is and where I got it. I love it. The good thing about lined pique is you can even get an on grain collar out of a chunk of fabric with no discernable top or sides. You know the lines of the pique are on grain by virtue of the way it is woven. So here is baby's gift ready to be wrapped. I finished the bubble EIGHT days before it is needed for the shower. Unheard of in my world. I ordered the the book from Amazon and it came yesterday. It is a beautiful big book that has been reprinted. The pages are big and the pictures delightful. Now if there is also baby wrapping paper upstairs get out of my way, I am headed out to buy a lottery ticket! I did find this often neglected notion to be very handy for this garment. 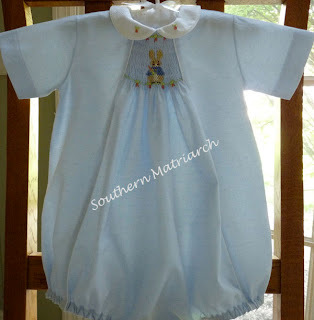 With the smocked neckline by the time you get the smocked panel, piped on either side seam, add the lining behind the panel, the 3 layers of the piped collar and bias neck band you have SEVEN to NINE layers in some spots to turn to the back and hope it stays there. This little gem was invaluable. I had used it before but to bang the life out of bulky points etc. Well imagine my delight when I actually followed the DIRECTIONS printed right on the front! Jeezo pete, worked great. My iron puts out an obscene amount of steam so shaping the neckline around my pressing ham, steaming it and then applying pressure with the clapper did the trick. You do have to let it cool and dry before you handle it again but it turned that neckseam to the back and stayed there. So next time a lot of layers give you trouble remember to grab your clapper. What a lucky mom and baby!! The out fit is so adorable! Pairing it with the book is ingenuous!! I need that clapper. I will remember this gift when I need to gift a baby again. What a beautiful gift to be giving!Lovely work, Martha. I love your blog. It gets my creative juices flowing. 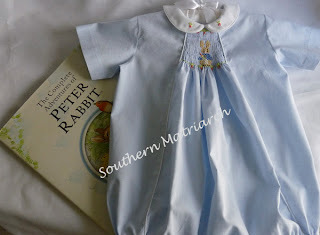 The smocked children's clothing that you make like this Peter Rabbit outfit, are my favorites. Keep up the good work. This is absolutely amazing! What a wonderful gift! 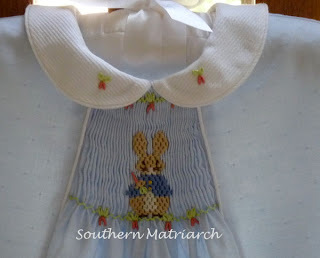 I love the sweet rabbit smocking plate. Any idea as to where I can find this?